“The cup of blessing which we bless, is it not a participation in the blood of Christ? The bread which we break, is it not a participation in the body of Christ? 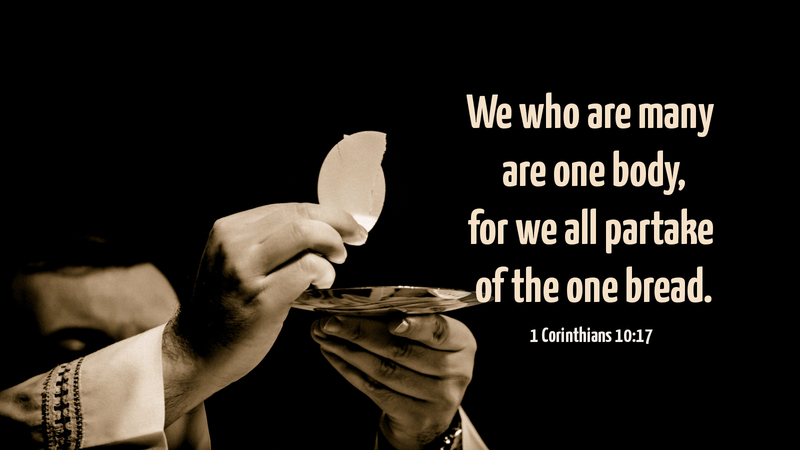 Because there is one bread, we who are many are one body, for we all partake of the one bread” (1 Cor 10:16-17). I am forever thankful that Martin Luther had it right, especially with regard to the Lord’s Supper! Blessed Martin might not have had everything right, but in the most important things—he was right on. Our Lord, Himself, instituted His Holy Supper. He says, “This is my body; this is my blood of the new covenant—do this for the remembrance of me.” Luther had no hesitation—when our Lord said “This IS my body and blood,” He meant what He said. Some in our world may debate what the meaning of “is” is. Luther had it right. We trust our Lord at His word. When we share the Lord’s Supper, it is His body and blood that we are eating and drinking. Maundy (as in Thursday) comes from the Latin word, “command.” Jesus commands us to “do this.” He also commands us to “love one another as I have loved you.” Interestingly, He commands us to wash one another’s feet! We continue to obey all of Jesus commands, but we do cherish and esteem highly the Lord’s Supper, the Sacrament of Christ’s presence among us. I believe this is one time when we can trust that most every congregation will be sharing our Lord’s body and blood today. We are united at the table of the Lord, though we are gathering in many places—in beautiful churches, in storefront worship spaces, in house churches where we gather as the first Christians often did! We are not united because we are Lutherans, or members of the NALC—we are one because we all partake of the one cup and the one bread, so that we who are many are one body! Prayer: Lord Jesus Christ, we are one through your body and blood. Make our unity a powerful witness to our broken and hurting world. Amen. Amen. One body, many parts. We need to humbly submit to our Lord and Savior. I have visited many different churches and many denominations, most have the same mindset that it is the body and blood of Christ that unites us. It is man’s attempt to be lifted up that corrupts that very lifestyle.